A Far and Wild Safaris guide will collect you from your overnight accommodation or from the King Shaka International Airport in Durban and travel on the edge of the "Valley of 1000 Hills" and then past the capital city of Pietermaritzburg onto the "Midlands Meander". The Midlands Meander is what weavers, potters, woodcrafters, leather workers, artists, metalworkers, box makers, herb growers, cheese makers, beer brewers and pianos have in common. You will find them all, and a great deal more on the Midlands Meander map - South Africa's first, largest and most popular art and crafts route. From a very small beginning, the Midlands Meander has grown to well over a hundred stops on four routes. Originating with the arrival of the first settlers in the early 1800's the area boasts many wonderful homes and barns, an attraction to lovers of architecture. As you tour the Midlands Meander you will also notice that this area is home to a number of the country's most famous schools. This morning we transfer to our 4X4 vehicles for the ascent up the Sani Pass and into Lesotho. Breathtaking scenery and alpine conditions dominate this truly magnificent corner of this province. The Sani Pass is a spectacular mountain road that is a well-known entry point into Lesotho from South Africa's Natal Drakensberg Park. It is the gateway to the 'Roof of Africa' scenic route that links the spectacular scenery of the Drakensberg with the mountains of northern Lesotho. The Sani Pass is the only border post between Kwazulu-Natal and Lesotho. The Sani Pass was once a rough mule trail descending the Eastern Highlands of old Basutoland into Natal. Tough drovers brought wool and mohair down the Pass on donkeys and mules to be exchanged for blankets . clothing . maize meal . the essentials for life in a remote, impoverished country. And a young man had a dream . of operating a motor vehicle service up this fantastic Pass, using the 4-wheel drive vehicles he had seen on service in World War II. The Sani Pass was born. Once we have entered Lesotho we will stop off at a Basutho village where one can learn more about the life of these very friendly people, in this, one of the world's poorest countries. Lunch will be at the "highest pub in Africa", the Sani Top Chalet, for your own account. We will also have some time here to walk along the edge of the escarpment for stunning views into KwaZulu Natal, before descending the pass to Moorcroft Manor. After breakfast we make our way east of Ladysmith to the extraordinarily beautiful and geographically diverse Nambiti Private Game Reserve, home to elephant, lion, leopard, buffalo and rhino (including the rare and endangered Black Rhino), as well as over 30 other animal species. It is also rich in birdlife and indigenous flora. Unlike most other game reserves, the Nambiti Private Game Reserve has the carrying capacity of almost twice that of wildlife regions such as Botswana, thus being able to carry more game per hectare than many other game reserves. 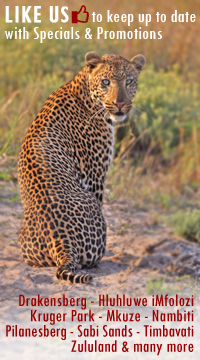 Knowledgeable guides will plan a safari that takes into account your particular interests and requirements. Today we follow the lodge programme, which usually includes a morning game drive, breakfast, sometimes a guided walk (which is optional), lunch, afternoon tea followed by the evening game drive and dinner. Game viewing here is very good, and generally close up sightings of their animals are experienced.